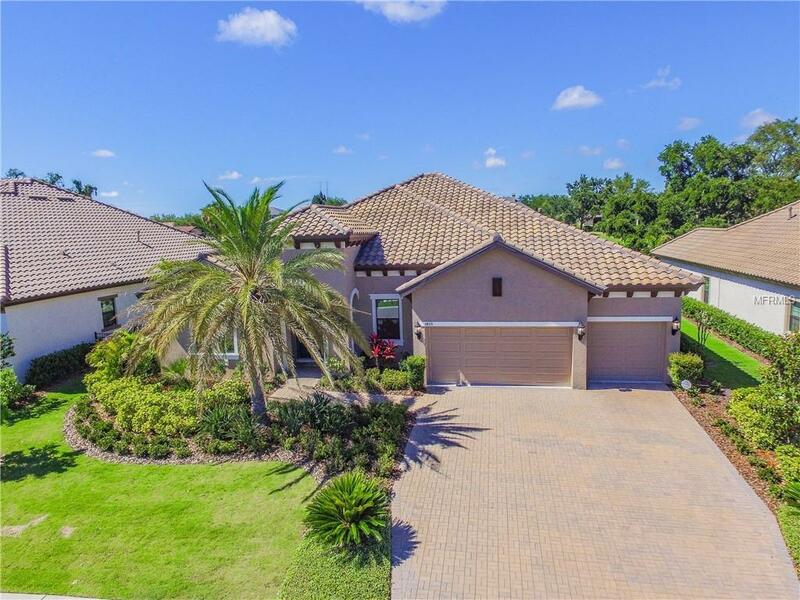 Desirable Prime Lot in the Promontory at Innisbrook! Located on the 14th Green of the Island Course. Move in Ready in this Open Floorplan with Grand Features such as Double Wrought Iron Door Entry into Extended Foyer. ENORMOUS Great Room with Tray Ceiling and Pocket Slider leading to Lanai. The Gourmet Kitchen boast Top of the Line Custom Glazed Wood Cabinetry with Glass Deco Doors & under cabinet LED Lighting, Large Island, GE Monogram French Style Refrigerator, Stainless Steel Appliances, Double Advantium Convection Built in Ovens, 5 Burner Natural Gas Cooktop with Cabinet Hood and Pot Filler. Large Dining Space- Great for Entertaining. Polished Nickel Chandelier in Dining Room. Indulge yourself in the Oversized Master Suite with Sweeping Views of the Golf Course and Sparkling Pool. En suite Spa Like Master Bath with Beautiful Tile Step In Rain Shower, Quartz Counter Top with Double Sinks, Soaking Tub and Private Water Closet. Additional Bedrooms with Adjacent Bath, Bonus Room could be 4th Bedroom. This home includes State of the Art Water Filtration and Softening System. Enjoy and Entertain Family and Friends in the $60K Pool Package with Water Fall and Sun Shelf. The Promontory features a neighborhood Park, Dog Park, and magnificent views of the Golf Course. HOA Monthly Fee includes Lawn and Shrub Maintenance, Sprinkler System, External Pest Control, Common Areas & Roads. Innisbrook amenities include 4 championship golf courses, 6 swimming pools, tennis, Spa, and more. Additional Lease Restrictions Application And Approval Required Please Confirm With Meritus Community - 813-397-5122. Amenities Additional Fees Mandatory Innisbrook Membership Required - Starting At Social Membership $149 Year + $149 Month. See Attachments. Innisbrook Features 4 Golf Courses 6 Swimming Pools Tennis Jogging & Cycling Trails Salamander Spa Fitness Center And 4 Restaurants. Pet Restrictions 3 Pets Allowed And Breed Restrictions- Please Confirm With Meritus Community - 813-397-5122.